SPOKANE, Wash. (AP) — A woman has filed a claim that she was sexually abused more than 40 years ago by Bishop William Skylstad, president of the U.S. Conference of Catholic bishops and leader of the Spokane Diocese. Skylstad issued a statement Wednesday categorically denying the accusation, saying he has not violated the vow of celibacy he took 47 years ago. The claim was filed against the Roman Catholic Diocese of Spokane on Dec. 27 by a woman who said she was under the age of 18 when Skylstad sexually abused her at St. Patrick's Parish and at Gonzaga University from December 1961 to December 1964. Bishop William Skylstad last month offered to settle with 75 victims for $45.7 million. Skylstad was a student at Gonzaga University from 1962-1966 and taught mathematics to students at Mater Cleri Seminary at Colbert, north of Spokane. The diocese is one of three in the nation that filed for bankruptcy protection to deal with claims of sexual abuse by clergy. Skylstad last month offered to settle with 75 victims for $45.7 million. The woman's claim was filed as a result of the bankruptcy "proof of claims" process, the diocese said. 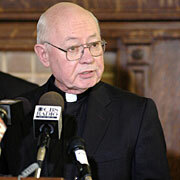 Victims of clergy sexual abuse have until Friday to file claims. Greg Arpin, an attorney representing the diocese, said there were a total of 135 claims as of Wednesday morning, including the original 75 who would be covered by the settlement. The woman's claim was first reported Wednesday by the Spokesman-Review newspaper of Spokane. It is unclear under the reforms American bishops adopted in 2002 for responding to abuse claims whether Skylstad should temporarily step down while his case is being investigated. The policy requires Catholic officials to determine whether there is "sufficient evidence" supporting the allegations against a cleric before they take him out of public ministry while a full review is conducted under Vatican oversight.